The Micom Alstom P747 centralised numerical busbar protection provides complete protection for all voltage levels up to extra high voltage busbar configurations. Proven techniques and dynamic topology processing algorithms offer a combination of security, speed and high sensitivity. The MiCOM Alstom P747 differential busbar protection provides a centralised 3-box architecture and is very simple to use. MiCOM Alstom P747 can accommodate up to 4 zones plus check zone and protect up to 18 terminals. The P747 Is particularly useful in double busbar with double bus coupler applications. It allows a high number of opto inputs, relay outputs, virtual inputs and virtual outputs to be used for communication exchange between boxes through GOOSE messages in order to manage the complete substation scheme. The MiCOM Alstom P747 also incorporates enhanced circuit breaker failure logic together with additional protection functions such as dead zone and overcurrent. In addition to the protection and control elements, the P747 provides a wide range of measurement, monitoring, post fault analysis and self-diagnostic features. Powerful programmable scheme logic (PSL), trip circuit supervision, fully customisable menu texts, multi-level password protection, on-line measurements and plant status monitoring are all included. 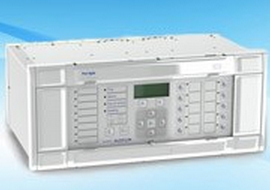 P747 employs an innovative external fault detection algorithm to ensure stability when CTs become saturated.